Really quite lovely. Here we have a fine French chandelier by Ezan that just demonstrates the variations of the Art Deco design in one lovely fixture. 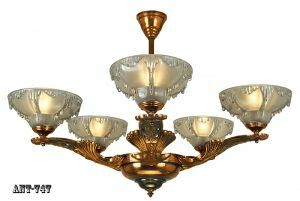 Circa 1920-30, it is truly a lovely chandelier. The shades are really quite unique. Heavy cast glass, with heavy embossed rib designs. Add to those lovely shades the lovely drips of glass down the body of the chandelier, and you can see the design excellence we can see from Ezan. The design of the arms is absolutely beautiful, and hard to find. This chandelier has been completely re-wired in our UL shop with new American sockets, and all new wire. 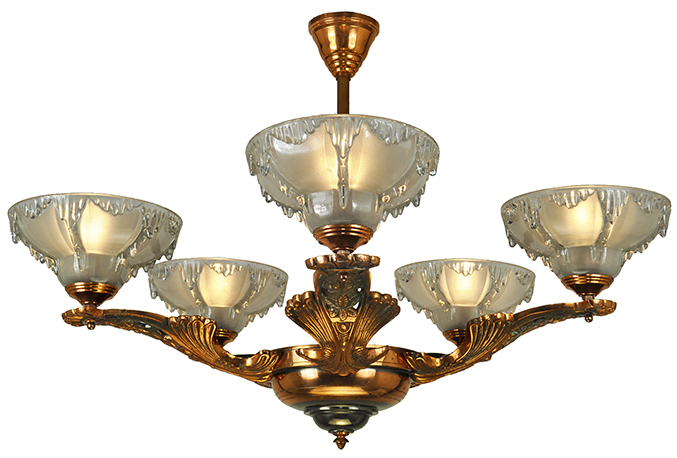 The five shades around the center are wired with American candelabrum sockets built inside the original French/British style B-22 pin socket housing. Kind of clever, so we can use the original shades without any noticeable difference at all. We used a neat bulb that does not rise above the shade, and they come with the chandelier. 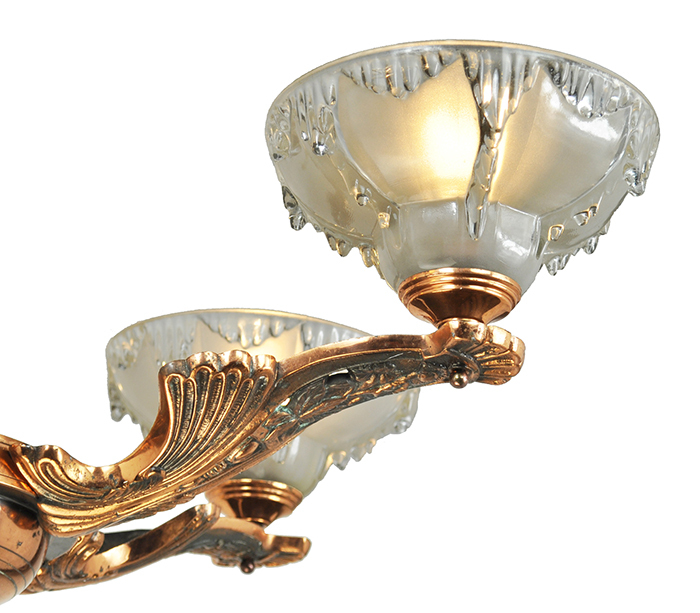 Price for the chandelier is only $1,750.00 plus careful packing and shipping. 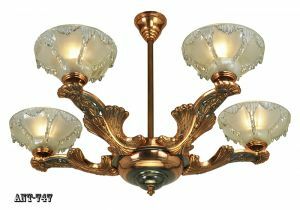 I say "only" because if you have done some chandelier shopping elsewhere, you will know that some folks are asking upwards of $3,000.00 for a fixture of this type, and often, not as nice as this one. We're more realistic, and believe that fair pricing is best. Shipping is a bit extra.